One of the creative arts. It is this comprehensive range of subjects that makes the Diploma Programme a demanding course of study designed to prepare students effectively for university entrance. In each of the academic areas students have flexibility in making their choices, which means they can choose subjects that particularly interest them and that they may wish to study further at university. English A literature is a course designed to make the students fall in love with literature! For those who already love literature, the course offers an exposure to different genres, time periods and literature from across the globe, including literature in translation. The IBO offers a wide array of choice available for the tutors to choose texts from and these can even include works by current writers, from any part of the world. The thrust of this course is to develop critical thinking skills while instilling an ability to evaluate literature by applying tools of literary criticism. It values independent opinion and reasoned arguments and has a natural connect with the IB learner profile-makes the students open minded, reflective, inquisitive as well as communicators. The focus of the classes is not to merely comprehend but to question and appreciate the skill of the writer in communicating his or her ideas. There are four parts covered in the two year course and the assessment is both oral and written. In two years, the students are involved in animated discussions on texts ranging from Antigone by Sophocles to Kite Runner by Khaled Hosseini. This course is ideal for students who enjoy literature and who believe, ‘The reading of all good books is like conversation with the finest men of past centuries.’ ― René Descartes. English Language and Literature is a relatively new course offered by the IB but, in a short time, has become an exceedingly popular one. It comprises 4 parts- two relate to the study of Language and 2 to the study of Literature. Through the study of how language develops in specific cultural contexts, thus shaping individual and group identity, to understanding how language is used in media, the students gain fascinating insights into the world of language. Thus, through a study of public speeches, advertisements, cartoons, graphic novels and much more, this course equips the student to understand how language can be used as a tool of persuasion, manipulation and conviction, providing him or her with the verbal as well as written ability to analyse and to use language effectively; an essential life skill. In the Language and Literature course’s Literature component, plays, novels and poems are studied. Here, again, while the content deals with Literature, the thrust of the approach is the context in which the text is written and received and how a difference in context can impact its interpretation and reception, thus developing critical literacy in the student. The course is best suited for the thinking student who does not necessarily have to be of a literary bent of mind to excel. It is of special interest to anyone looking at public speaking, media studies and mass communication and, through its multi prism approach, promises that one will never look at a text, written or visual, the same way again. The language is offered to those students who have no prior understanding or exposure to French. Each theme has a list of topics that provide the students with opportunities to practise and explore the language as well as to develop intercultural understanding. Through the development of receptive, productive and interactive skills, students should be able to respond and interact appropriately in a defined range of everyday situations. Language B is a language acquisition course developed at two levels—Standard Level (SL) and Higher Level (HL) for students with some background in the target language. While acquiring a language, students will explore the culture(s) connected to it. The focus of these courses is language acquisition and intercultural understanding. The language B syllabus approaches the learning of language through meaning. Through the study of the core and the options at SL and HL, plus two literary works at HL, students build the necessary skills to reach the assessment objectives of the language B course through the expansion of their receptive, productive and interactive skills. 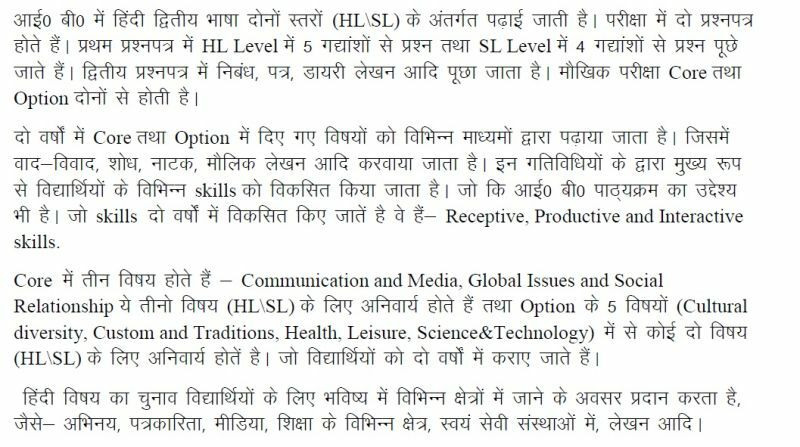 SL and HL are differentiated by the recommended number of hours, the depth of syllabus coverage, the study of literature at HL, and the level of difficulty and demands of assessment and assessment criteria. The core — with topics common to both levels—is divided into three areas and is a required area of study. 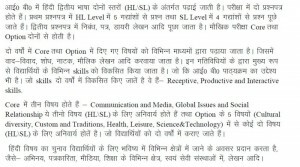 In addition, at both SL and HL, teachers select two from the following five options. Also, at HL, students read two works of literature. It is best suited for students with an aptitude for languages and for any student interested in studying in Europe or interested in further higher studies in Language acquisition /translation and even in Travel and Tourism and Hotel Management. Spanish Ab initio is a rigorous introductory course, designed to provide students with basic communication skills that would enable them to: discuss common topics, read and understand limited types of text and write conversational and narrative compositions. The study of the Spanish language entails acquiring a language system and applying it in four active and interrelated ways: listening, speaking, reading and writing. These four primary language skills will be develop to a similar level of communication. At the Ab Initio level, the emphasis is on a practical utility. Students will write in multiple formats with attention to language, message and context. Speaking and listening skills will be taught through picture descriptions and simulated conversations. The course will focus on themes including hobbies, family, school life, health and food, city and travel, daily routine, media, holidays and environment. Students will be introduced to the culture of the Spanish-speaking world and conduct individual research about a specific cultural topic that they will describe and compare to their own culture. Business Management introduces the student to the nuances of business by briefly touching upon aspects of Human Resources, Marketing, Accounting & Finance, Growth and Operations. Through this, the student is able to understand real business cases and analyse case studies from the perspective of an entrepreneur. All factors affecting business like Change, Culture, Globalisation, Innovation and Ethics are taught, using examples from real organisations. The Research conducted for the internal assessment helps apply the concepts taught by actually working on a real problem being faced by the organisation under study. The course is best suited for a student who is looking at a career in business or entrepreneurship. An extremely popular subject choice, IB Economics delves briefly into the four core spheres of the subject: Micro Economics, Macroeconomics, International trade and Economic Development. During the course of two years, the student understands how economies function, both at the micro as well as the macro level and is empowered to apply theoretical concepts to current scenarios. Synthesis and evaluation are at the heart of their study and students are equipped to not just understand but also analyse events and their implications. Microeconomics deals with the all- pervading demand and supply in markets, market failure, theories of the firm, laws of production, cost and revenue analysis and market structures. Macroeconomics covers a wide range of topics from national income to inflation, unemployment, income distribution and monetary and fiscal policies. The very relevant trade relations between countries, trading blocs and balance of payments are covered under the International Trade section and Economic Development, as the name suggests, covers all aspects of development. Those keen to pursue inter disciplinary studies such as management, environmental studies, law, business and even the sciences benefit from opting for this course. It enables the child to not be simply financially literate but also to understand and appreciate the importance of economics in every aspect of one’s life. “We are not makers of History. We are made by History.” –Martin Luther King Jr.
IB History is a study where one raises questions, arguments and varied viewpoints. It uses interpretation, critical analysis and evaluation to create an empathetic understanding of the people and events in History. The course prepares you well to look at social issues critically and take an informed stand on them. Thus, it is not just the past which gets enlivened, but also the present, and the future scenario is the canvas on which the criticisms of what went wrong is constantly tested. The IB History curriculum is an exciting one since it is extremely broad-based, allowing the facilitator to custom design it to suit any particular batch of learners. Each of the three papers is formulated to develop different skills in the learner. Paper 1, which is source-based, is designed to develop key historical skills, including a sense of chronology and context, and an understanding of different historical perspectives through engaging effectively with sources. Paper 2 is theme-based, bringing to the students’ multiple perspectives and appreciation of the complex nature of historical concepts, issues, events and developments through the study of world history topics. Paper 3, which is the higher level paper, develops in the students, historical consciousness and an understanding of history as a discipline. It promotes international-mindedness in them through the in depth study of history of a particular region of the world. Finally, it increases their understanding of themselves and of contemporary society through reflection on the past. The new syllabus, to be examined for the first time in 2017, includes a range of topics related to the history of countries throughout the world, from the early medieval period to the twenty-first century. The students may choose to learn about military leaders like Ghenghiz Khan or Richard I, or the conquest of Southeast Asia by Japan, and Europe by Germany and Italy during the Second World War. They could learn about internal conflicts with international dimensions in places such as Rwanda and Kosovo, or protest movements in South Africa or the United States. World history topics range from society and economy in the 8th century to the impact of industrialisation in the early years of the 21st century; and from the significance of medieval wars to the impact of 20th century ones. Regional history allows the intensive study of the history of one particular region, such as the Americas, or the Middle East and Africa or Australasia or Europe. As can be deduced from this, the IB History curriculum is eminently appropriate for preparing the student to take up almost any course of study or profession. A student of IB History is eminently suited to take up the study of law, mass communications or journalism, international relations, political science, museology, archaeology or anthropology, with the aim of taking up the profession of a lawyer, a journalist, a political analyst, a marketing analyst, an advertising executive, a curator or museologist, an archaeologist, an anthropologist, a historian, a politician, or an administrator, especially as a member of the foreign service or diplomatic services. The IB DP Psychology course is the systematic study of behaviour and mental processes. The Psychology course examines the interaction of biological, cognitive and sociocultural influences on human behaviour. Students undertaking the course can expect to develop an understanding of how psychological knowledge is generated, developed and applied. This will allow them to have a greater understanding of themselves and appreciate the diversity of human behaviour. The holistic approach reflected in the curriculum, which sees biological, cognitive and sociocultural analysis being taught in an integrated way, ensures that students are able to develop an understanding of what all humans share, as well as the immense diversity of influences on human behaviour and mental processes. The ethical concerns raised by the methodology and application of psychological research are also key considerations of the IB psychology course. The skills that will get developed over two years will be researching skills, lateral thinking skills and connectedness and an ability to observe and reflect on behaviour in the real world. The course builds up a non- judgemental attitude and appreciation of individual differences in behaviour and thinking. Students start seeing the applications of Psychology in all spheres of life. This opens up the professions of clinical, organisational, criminal and sports psychology, amongst others. Social and Cultural Anthropology is a subject which gives students a deeper and clearer understanding of the society we live in. It is the comparative study of culture and human societies. This course lays a strong emphasis on making students develop intercultural understanding, open-mindedness, and progressive outlook necessary for them to respect diversity among people. This course essentially builds researching skills through experiential learning. It dwells deep into issues of Anthropological inquiry such as belonging, communication, expression and technology; development; health, movement, time and space; production, exchange and consumption etc. Social and Cultural Anthropology focusses on gaining in-depth understanding of real world issues such as Conflict, Injustice, Inequality and Human Rights to name a few. At the core it builds individuals into reflective, critical thinkers who learn to understand the dynamics of social change. It believes in building purpose and motivation in each individual to contribute in transforming the world into a more positive existence and definitely for themselves to be lifelong learners! 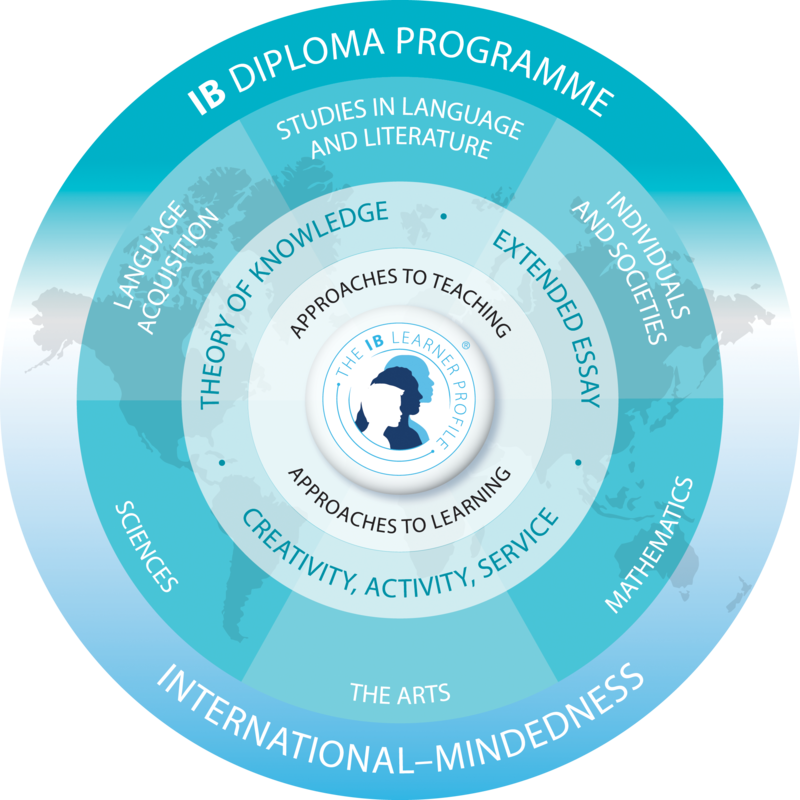 An intensively well rounded subject matter is the essence of Social and Cultural Anthropology at the IB. Environmental Systems and Societies is a combination of Biology and Geography, with a variety of inputs from many other subject areas. Consequently, it satisfies the requirements of both Group 3 (Humanities) and Group 4 (Experimental Sciences). ESAS is only available at the STANDARD LEVEL. The prime intent of this course is to provide students with a coherent perspective on the interrelationships between environmental systems and societies; one that enables them to adopt an informed personal response to a wide range of pressing environmental issues that they will inevitably come to face. It also includes information from economic, historical, cultural, socio-political and scientific, to provide a holistic perspective on environmental issues at both a local as well as global level. Promote understanding of environmental processes at a variety of scales, from local to global. Provide a body of knowledge, methodologies and skills, which can be used in the analysis of environmental issues at local and global levels. Enable students to apply the knowledge, methodologies and skills gained. Promote respect for a diversity of cultural perspectives. Recognise the extent to which technology plays a role in both causing and solving environmental problems. Appreciate the value of local as well as international collaboration in resolving environmental problems. Appreciate that environmental issues may be controversial and may provoke a variety of responses. It will also help them to appreciate nature and work for its conservation. Physics, at the IB Diploma Programme, exposes the students to the most fundamental of experimental sciences, which seeks to explain the universe itself; from the very smallest particles to the vast distances between galaxies. Students can pursue this both at the Higher Level (HL) as well as the Standard Level (SL). In their study of the subject, they move beyond the theoretical and develop practical skills and techniques that they can apply in real world situations as they are presented with numerous opportunities for scientific study and creative enquiry within a global context. Simultaneously, they are able to hone their skills in Mathematics. Provide a body of knowledge, methods and techniques that characterize science and technology. Develop an ability to analyze, evaluate and synthesize scientific information. Encourage an understanding of the relationships between scientific disci-plines and the overarching nature of the scientific method. Students with Physics can opt for any branch of Engineering. A major in Physics along with Math is a good combination for all those who are looking to specialize in Astro Physics, Nano tech, Plasma Physics and Geo Physics. Chemistry is an experimental science that combines academic study with the acquisition of practical and investigational skills. It is often called, ‘The Central Science’ as chemical principles bridge other natural sciences. Apart from being a subject worthy of study in its own right, Chemistry is a prerequisite for many other courses in higher education, such as medicine, biological science and environmental science, and serves as useful preparation for employment. Observation remains an integral part of Chemistry, as a tool of investigation and inference and this requires students to tune their hypothesis to the inferences drawn from experiments. The scientific processes carried out by the students are essentially similar to the ones followed by eminent scientists all over the world. The Diploma Programme Chemistry Course not only includes the essential principles of the subject but also, through selection of an option, allows learners flexibility to tailor the course to meet their specific requirements. The Course also allows students to develop traditional skills and techniques, while approaching an investigation and increases their analytical faculty. Students are also able to develop interpersonal skills and digital technology skills, which are essential in the 21st century scientific endeavour and are important life-enhancing skills. Biology in the IB, is one of the most interesting subjects on offer. It is very unlike classical Biology,that is considered to monotonous and boring. The IB Biology curriculum includes Molecular Biology, Genetics and Genetic Engineering. It provides insight into the most advanced and latest developments in the field of Biology, such as cloning, genetic engineering and DNA fingerprinting. Apart from the academic focus, the curriculum also has scope to discuss the ethical arguments in favour of or against these processes. The subject is offered at both SL and HL, depending upon the interest and requirements of the individual student. Moreover, the Biology syllabus allows the student to attempt the SAT 2 subject test as there is a lot of overlap in the two. The curriculum motivates the student to pursue higher studies in Biology, including Medicine, Biochemistry, Biotechnology and even Psychology. The “Mathematical Studies” course is available at Standard Level (SL) only. It caters for students with varied backgrounds and abilities. More specifically, it is designed to build confidence and encourage an appreciation of Mathematics in students who do not anticipate a need for Mathematics in their future studies. Students taking this course need to be already equipped with fundamental skills and a rudimentary knowledge of basic processes. The Standard Level Mathematics course caters for students who already possess knowledge of basic mathematical concepts, and who are equipped with the skills needed to apply simple mathematical techniques correctly. The majority of these students will expect to need a sound mathematical background as they prepare for future studies in subjects such as chemistry, economics, psychology and business administration. The Higher Level (HL) Mathematics course caters for students with a good background in Mathematics who are competent in a range of analytical and technical skills. The majority of these students will be expecting to include Mathematics as a major component of their university studies, either as a subject in its own right or within courses such as physics, engineering and technology. Others may take this subject because they have a strong interest in Mathematics and enjoy meeting its challenges and engaging with its problems. Their own abilities in Mathematics and the type of mathematics in which they can be successful. Their own interest in Mathematics, and those particular areas of the subject that may hold the most interest for them. Their academic plans, in particular the subjects they wish to study in the future. Design Technology involves the mixing of technology and creativity in order to meet human requirements or needs. It consists of gathering information and data about a socio technical problem, planning for the possible solution of it which may involve design modification or research which may require use of design software like CAD/ CAM. All IBO courses comprise an internal and external assessment. Internal assessments involve course work which is carried out by the students with guidance by their teachers. External assessments are written exams. The IB Diploma Programme theatre course is a multifaceted theatre- making course of study. It gives students the opportunity to make theatre as creators, designers, directors and performers. It emphasizes the importance of working both individually and collaboratively as part of an ensemble. It offers the opportunity to engage actively in the creative process, transforming ideas into action as inquisitive and productive artists. Students experience the course from contrasting artistic perspectives. They learn to apply research and theory to inform and contextualize their work. The theatre course encourages students to appreciate that through the processes of researching, creating, preparing, presenting and critically reflecting on theatre – as participants and audience members – they gain a richer understanding of themselves, their community and the world. It enables students to discover and engage with different forms of theatre across time, place and culture and promotes international-mindedness. The Art Department at The Shri Ram School Senior Secondary Branch is dedicated to inculcating an ‘Artistic Temper’ in each student. The course covers the creation of an art work to curating an exhibition, understanding technical processes in great depth and insightful comparative studies of artists from different times and cultures. This is backed up by art on location field trips, museum and gallery visits, along with a strong visiting craftsmen program. Students learn to appreciate, make and respect art and artefacts in every form. Offering a huge choice of materials and mediums, we also teach that the art of work precedes the work of art. Our art alumni have done us proud by excelling in every art/design institution in the world. Be it film making, fashion, visual or graphic communication, textile and product design, branding, emerging media and the fine arts, the process begins right here at our Moulsari campus. What is CAS? It is Creativity, Activity and Service, whereby children are encouraged to participate in activities featuring all of the above, as well as come up with their own initiatives, which allow their creativity and ability to bloom into action and readiness to be of service in order to give back to the world. Reflective thinkers—they understand their own strengths and limitations, identify goals and devise strategies for personal growth. They are aware of themselves as members of experienced communities with responsibilities towards each other and the environment. Active participants in sustained, collaborative projects. Apart from our children’s own initiatives, we have also tailor-made activities for them. In March, our children go on a RAFTING TRIP, stay in camps and learn how to be in touch with nature. In year 1, our IB 11 students stay back in school on every Tuesday and organise activities such as dance, art, football, singing and theatre with the Balwadi children. In October, our children visit NIGLAT and participate in creative workshops involving art and craft as well as interact with the villagers. They live out in the open and learn how to manage on their own, looking after their own daily needs independently. In DECEMBER, our children do a workshop with an organisation called ‘Jagran’. ‘Jagran’ is a pantomime Theatre group and ‘The Jagran Workshop’ is an essential part of the creativity requirement for the CAS students. Students participate in ensemble building and improvisation work in the tradition of pantomime. At the end of the workshop, they perform a play for the community of Dakshin Puri. This is aimed at awareness building amongst the community on important social issues. They also interact with several NGOs such as NAZ and MUSKAAN, which encourage voluntary work for the special needs / intellectually challenged adults and for those who are infected with the HIV virus. a. Silver Surfer Programme- The Silver Surfer Programme is an attempt to bring about the benefits of technology to our most experienced-grandparents. It an endeavour from the students’ side to introduce technology to the experienced and give them the confidence to independently use technology to get in touch with their loved ones (old friends and family) and share their hobbies/interests. Topics shared are Gmail, Facebook, How to Blog? and How to use smart phones? b. Shri Music Festival – SMF, a student led his whole batch to organise a huge fundraising event which involved bands performing. NGOs were given the opportunity to sell their things and the money raised through this event was donated to 17000ft. 17000ft is an organisation that supports schools in Ladhak . c. Students raised money for the Blind Associating Press by organising a Bake Sale on Valentine’s Day. The students made the cupcakes and did a brilliant job. All cupcakes were personalised. This bake sale was a success and the students managed to make 30,000+. d. Project Why. In this project the student had taught students studying at an NGO about water sanitation and hygiene through innovative methods. Along with this, she organized fundraisers to buy a water purification system and got it installed within the NGO to provide the residents of the nearby colony Madanpur Khadar with clean drinking water. The student succeeded in both creating awareness and getting the water purification system installed. TOK essentially imparts critical thinking skills with the help of discussions bringing in different perspectives and socio-cultural filters in examining and evaluating questions about knowledge in different subject areas (Areas of Knowledge). Personal experience and reflection form an integral part of this inquiry thus not only creating a forum for in-depth questioning and understanding but also promoting a balance between theoretical and practical aspects. The tools that TOK uses to answer these questions are ‘8 Ways of Knowing’ which include sense perception, language, reason, emotion, memory, imagination, faith and intuition. ‘Areas of Knowledge’. There are two mandatory requirements of the TOK course as a lead up to granting of diploma. The internal assessment component is the Oral Presentation. The final TOK essay, written on a chosen topic from a list of prescribed titles, is externally marked. An overall TOK performance grade is awarded on the basis of both. 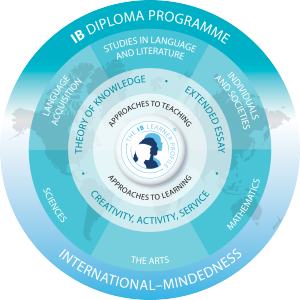 TOK lends itself to the IB learner profile to develop open mindedness as well as balanced and reflective individuals.